Beautiful graceful slender branches produce abundant pink flowers in early spring. Weeping Cherry is a very nice plant for the landscape and can be used as an anchor tree for the corner of your home. Plant approximately 10-12 ft. of the corner of the foundation to allow for spacing. 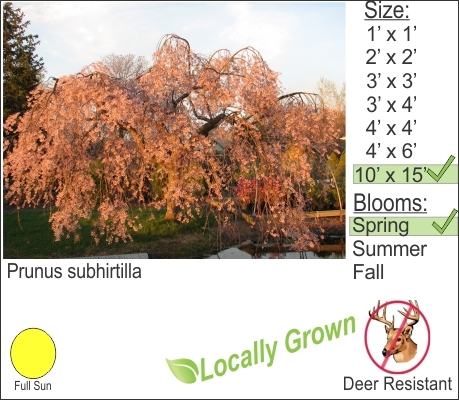 You can also plant this small growing tree as a stand alone specimen on your property. The tree placement can be centered to a picture window or set of french doors in the middle of your yard, so you can enjoy the tree even while sitting inside your home.